Idara-e-Taleem-o-Aagahi (ITA) celebrated this Women’s Day 2018 in accordance to the theme of UN women this year around that has pledged to make the underprivileged and less seen women in rural settings heard and seen. ‘This year, International Women’s Day comes on the heels of unprecedented global movement for women’s rights, equality and justice. This has taken the form of global marches and campaigns, including #MeToo and #TimesUp in the United States of America and their counterparts in other countries, on issues ranging from sexual harassment and femicide to equal pay and women’s political representation’ UN Women. Before the celebration of the day the theme was discussed with 5 EYAs of RTE Swat and they agreed on the plan presented by Dist: Campaign Officer. Two of the female EYAs were actively participating in the preparation. The event was conducted at The Educators Schools Swat with a great support from administration. The Event formally started with the recitation of few verses of Qur’an by one of student Eman. The Participants and guest were welcomed. Then the importance of the day was highlighted by District Campaign Officer. After that some of the students presented a play based on the “Education is the right of every girl”. The Chief Guest “Sabra Shakir” advocate Women rights addressed the participants about their rights and importance in the society in the light of Human Rights in national and international Law. 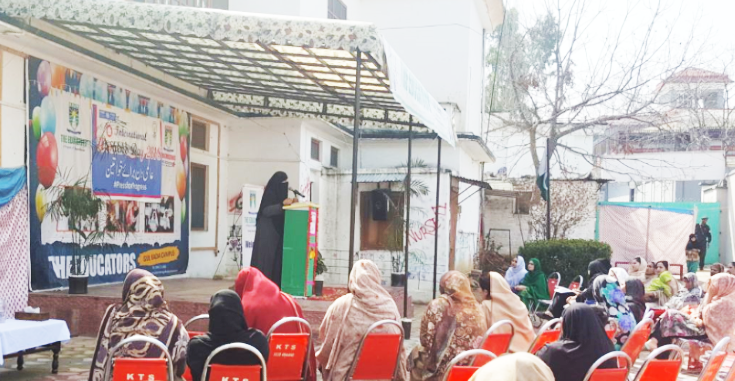 After that “Jameela Ahmad” Ex-MNA presented her speech on the theme “Islam and Women” where she highlighted the rights, role and contribution in Islam. At the last stage “Asiya Ejaz” coordinator Bhaitk school system motivate the female for education and their needs. At the end of event the participants appreciated the efforts and they thanked ITA for providing such a meaningful and fruitful opportunity where they were sensitized about the role and basic need (education). The struggle of ITA was appreciated by participants, they shared their opinion that highlighting the role and importance of women really needed and mean to them very much. They really enjoyed the gathering.